Air freshener service — A dispenser and refills are provided on an as needed basis in a variety of scents. Hand care service — Hand soaps range from heavy-duty cleansers for industrial dirt to gentle antimicrobial soaps for everyday use. Toilet Paper service – With our two roll, two ply dispensers, paper will always be available. 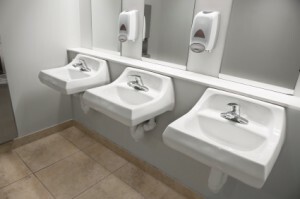 Paper/tissue service — Hands-free dispensers, manual dispensers, and center pull dispensers all help keep your restroom clean. These products help you ensure your restrooms have full and functioning dispensers, clean mops, and the highest quality hand care and paper products. We will monitor and replenish your stock to ensure availability, eliminating you being without product. This managed restroom supply program will save you time, money, and help ensure your customers are satisfied. **Contact us today and let’s help you get started with our Soap, Bath Tissue, & Air fresheners.